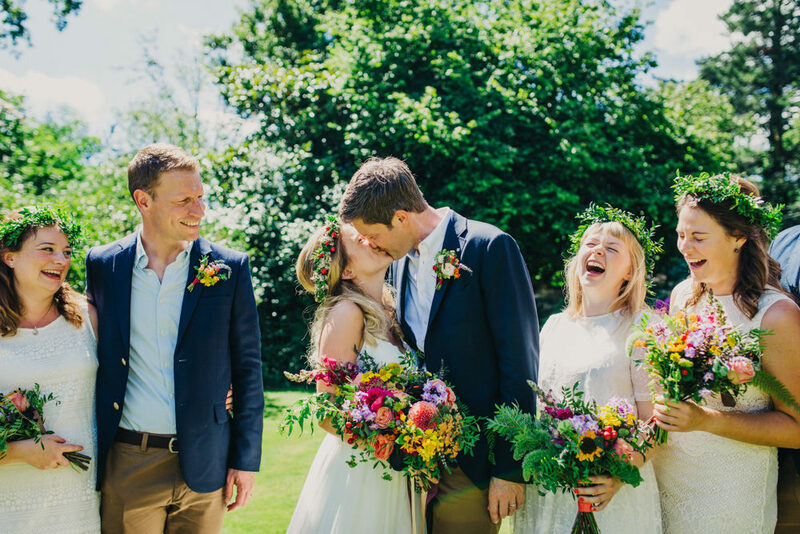 If you haven’t been longing for summer days yet, you certainly will after viewing this sun drench outdoor wedding at Shillingstone House in Dorset. 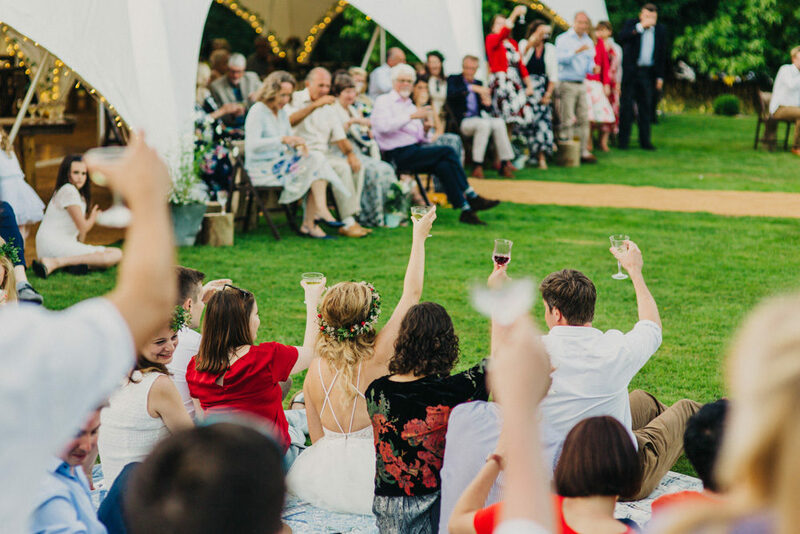 The speeches on the lawn look so relaxed and informal with guests huddled on picnic blankets and garden chairs soaking up all the atmosphere and love. I truly wish I was there to celebrate with them. 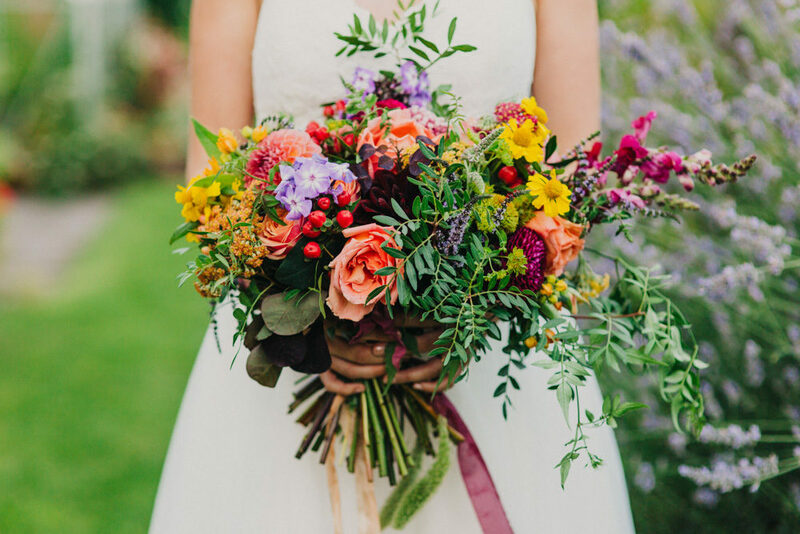 Making this wedding an extra special treat are the absolutely breathtaking bright blooms. They line the aisle, decorate the dessert table and form the most incredible bridal bouquet and flower crown you ever did see. They also POP and look incredible against the bridesmaids white gowns, not to mention the Brides stunning ethereal Willowby gown. 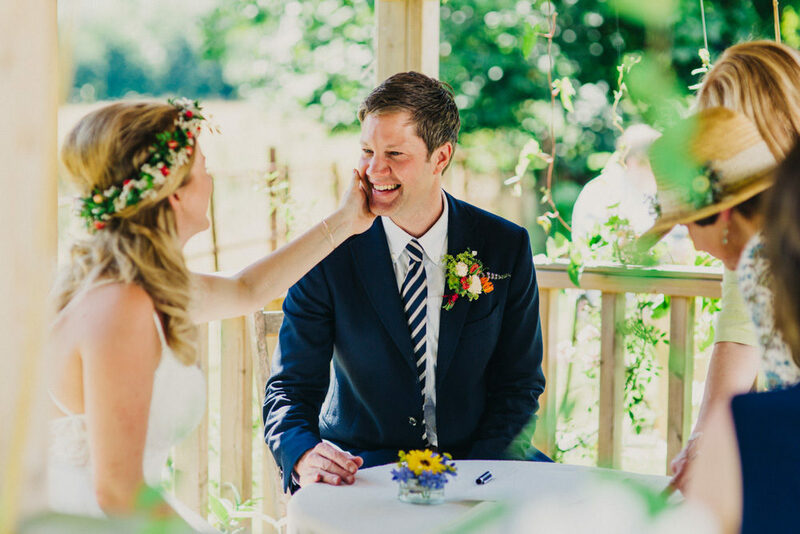 All the fun, colour and deliciousness has been captured by Peppermint Love Photography including one of the most heart achingly adorable moments during the wedding ceremony of the Bride tenderly holding her new husbands face, and him absolutely beaming back at her. Talk about off the chart adorable. Grace the Bride: We were so excited at the prospect of our marriage, but a move to London from Yorkshire, new jobs and a new house made wedding planning something of a struggle. Hopelessly disorganised, we created “the list”, which rarely had anything crossed off and only ever seemed to grow (and haunt us!). Now looking back at the day, we’re not quite sure how we pulled it off! Well, we do know: we were very lucky in our choice of suppliers, were blessed with a glorious sunny day and above all our family and friends were there to carry us through. 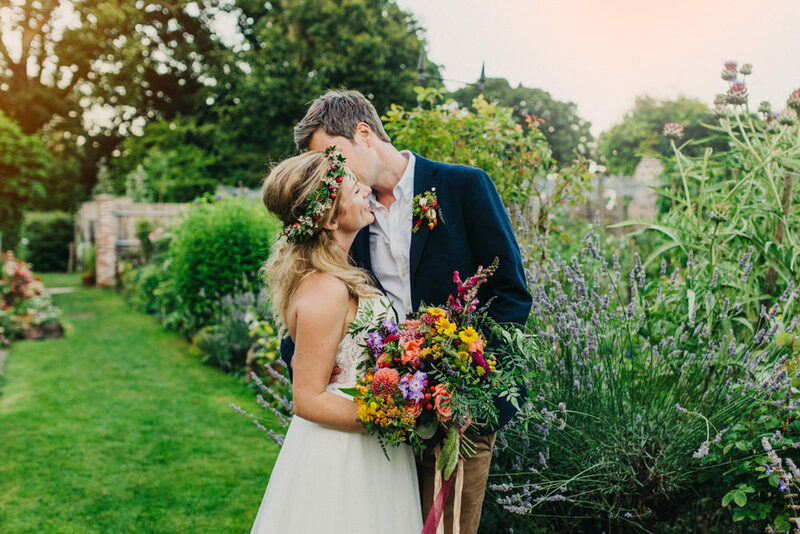 One walk around the grounds of Shillingstone House and our hearts were set; it was a beautiful, old and clearly loved family home in peaceful and secluded countryside, with pretty gardens to explore and large lawns to make our own. Alex’s parents live in the village next to Shillingstone, and the owners of the house, Sir and Lady Salt, had ties to Alex’s old school and knew his parents through the infamous Wessex Morris Men. Having moved around a lot myself, having some roots to the venue made it all the more special. 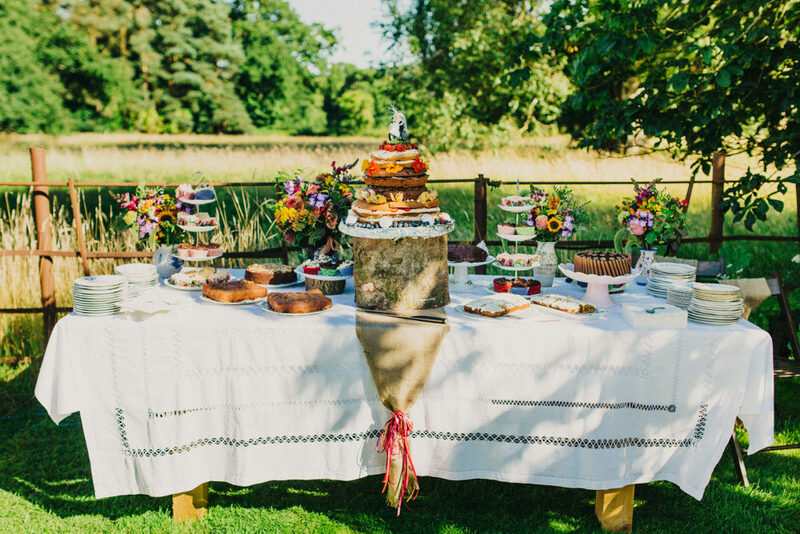 The planning and ideas flowed once we’d selected our venue: an outdoor ceremony, a picnic, outdoor games & music, a barbeque and bonfire. We just wanted everyone to relax, have chance to catch up with each other and basically have a big old party! One of my bridesmaid designed the wedding stationery, she’s so talented I could change nothing from her first draft and looking back at them they totally embodied the day. I’m so proud of them – not that I’d contributed that much! 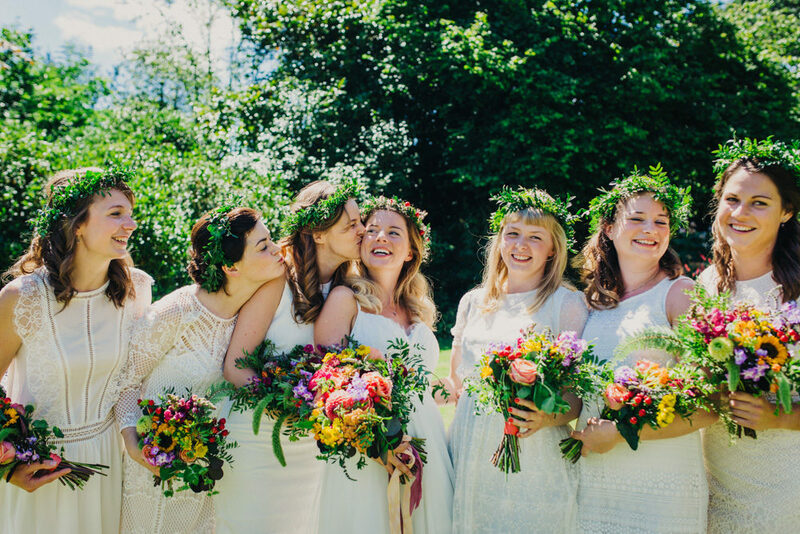 I am so truly grateful we decided to go all out with the flowers, it suited the venue so much and engaging Emma from Martha and the Meadows was one our best decisions. 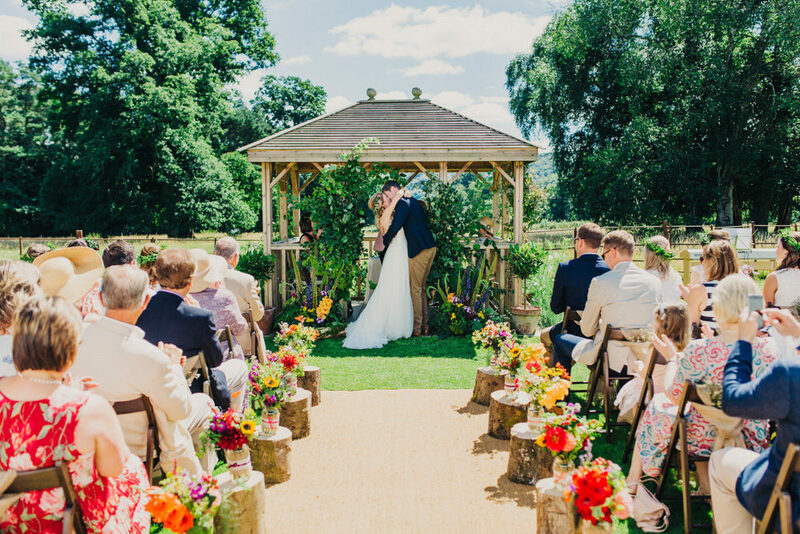 Emma transformed the gazebo into a stunning wedding bower and created the wedding bouquets and in the themes of “clashing colours” and “wild abandonment”. I still can’t get over how colourful and happy all of the photos are. This sounds awful but we were so stretched in the run up we actually charged my parents with the organising of the food, with the one request that it was vegetarian as it’s something I feel strongly about. John, from Cashew Catering (apparently!) was an absolute delight to work with and he wowed us at the wedding with a mouth-watering picnic, “naked” cake, and a beyond delicious evening barbeque. We doubled up our one holiday of that year with a “booze cruse” to the Alsace region of France to collect lots of wine for the wedding and chose local brewers Cerne Abbas Brewery and Purbeck Cider Co. to complete the selection. 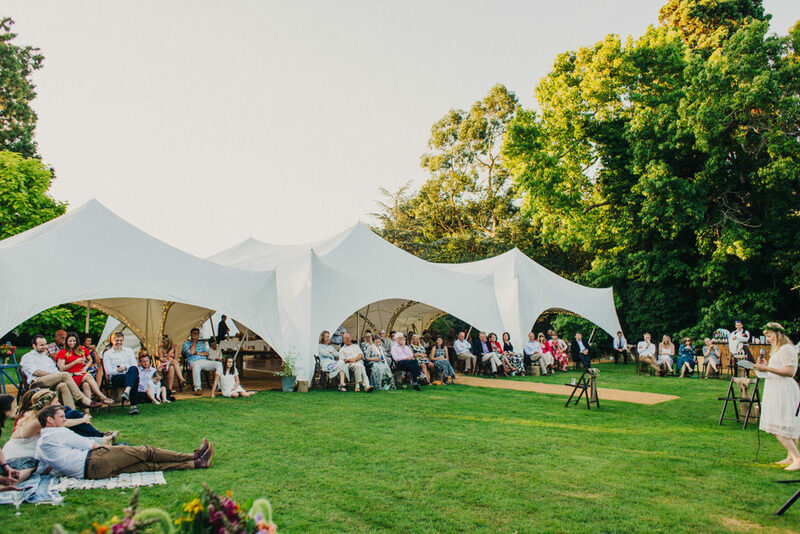 The lovely capri style marquees, provided by Marqo Marquees, allowed the guests to drift in and out of the shade and my mother had spent many hours making beautiful hessian table runners and chair wraps to adorn the rustic tables for the guests to enjoy the relaxed style dining. Land and Wave set up a village of bell tents which added to the festival air and (importantly for us) meant that the guests had the freedom to celebrate as long as they liked. 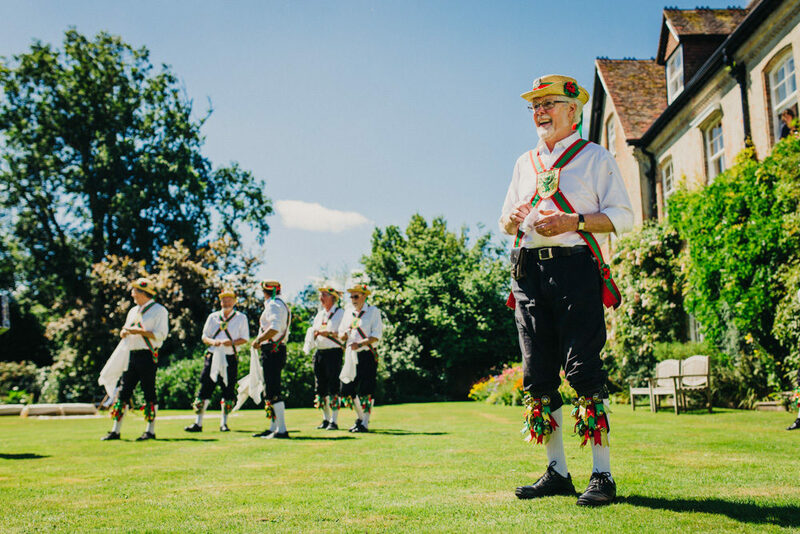 The Wessex Morris Men added to the summer fete feel, with the groom’s father leading the dancing. Obviously the groom, best man and ushers were always going to be pulled in to the final dance, much to the amusement of our guests. As the sun began to set, the band, Pulled Strings started their set, and the beautiful weather allowed them locate out on the lawn. It was a lovely summer evening, so unplanned, we organised the speeches on the lawn followed by a dreamy first dance under the stars. The band played on into the night and dancing ensued, with some guests drifting off to sit and chatter around the bonfire. Every decision we made was aimed at making it a fun day out for our family and friends; what better way to celebrate our love than being surrounded by lots of happy smiling faces?! And the photos by Kasia of Peppermint Love Photography are now my most precious possession… All that fun loving captured in such enigmatic and natural photos. Given our haphazard planning we look back through the photos and re-live the day with amazement; it’s so cliché but it was actually the best day ever. I chose my dress from Emma Elizabeth’s Bridal boutique in Twickenham and Alex chose a blazer from Gant and Chinos from Banana Republic. Wow, this looks like a fun wedding day!! I would love to photograph a wedding like this, so relaxed and so much fun! I adore the stationary, and how perfect that one of Grace’s bridesmaid was able to do this for her. The colours here are right up my street. I LOVE the floral bouquets, absolutely stunning. Thank you!! 🙂 I adored creating it, and I was so pleased that Grace and Alex loved it too. I’m getting married in a few months, and this post made me more excited for my garden wedding. My fiancé and I just finished choosing and organising some aspects of our wedding like the cake, decorations and food. However, we are still looking for tents that we can acquire for our special day. My best friend already recommended a supplier who can provide an outdoor marquee for sale, but I need more options to choose from. Can you help me out on this? Do you know where I can find other marquee providers?